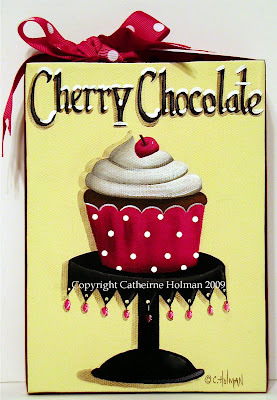 This "Cherry Chocolate Cupcake" painting is listed on eBay and ends this week. A chocolate fudge cupcake mixed with cherry pie filling is topped with fluffy, butter cream, piped frosting with a cherry on top. Displayed on a black cake stand embellished with tiny ruby colored crystals, this dessert is a treat for the eyes as well as the tummy. 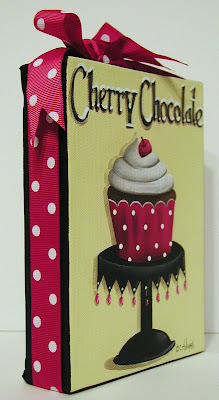 This fudgey, cherry concoction is wrapped in a cute red and white polka dot cake liner. A red grosgrain ribbon with white dots is wrapped around the edges of the canvas and tied in a bow at the top. Now please rush right over to Laurel Plum Online because she's offering a "Giveaway" of one of my prints. The giveaway ends this Friday the 27th. Laurel has a beautiful blog full of tips on getting organized. Just popping in to say "hi"...and, I wanted to let you know how much I love all these cute cupcake designs! I am trying to decide which ones I need to add to my collection. :) I am thinking I need to redo my kitchen's theme so I can really just focus on decorating with all of your dessert designs! I've already picked out one for my mom that I know she will love. I'll decide on a few others and be in touch soon. Just wanted to say "hi" since I haven't been by in a while. Beautiful work...your designs truly make me SMILE!! I just put my name in for one of your beautiful folk art paintings. A great giveaway. Love the new cupcake, and it sounds delish! Hello Catherine; As always you have done an awesome job on your paintings. This one is just so luscious looking. mmmmmm makes me want a cupcake....lol love all of your work..
Love your new cupcake, Catherine! Another wonderful cupcake! Dare I ask how the diet is going? Your cherry cupcake is wonderful Catherine. Those are MY colors! lol This painting is very cute and you know I love them ALL! I am enjoying the cupcake theme! Makes me want to bake! This is lovely! Are all of your cupcake paintings inspiring you to bake more cupcakes?